Uftring Nissan, a Peoria, Illinois Nissan dealer expects the world's first affordable, zero-emmision car in 2010 at our dealership on Allen Road and Willow Knolls in Peoria. Designed specifically for a lithium-ion battery-powered chassis, Nissan LEAF is a medium-size hatchback that comfortably seats five adults and has a range of more than 160km (100 miles) to satisfy real-world consumer requirements. 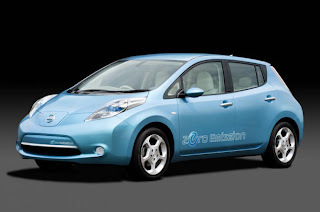 The Nissan LEAF ushers in a new era of mobility – the zero-emission era. The car is the embodiment of Nissan's radical, transformative vision for the future and the culmination of decades of investment and research. The "LEAF" name is a significant statement about the car itself. Just as leaves purify the air in nature, so Nissan LEAF purifies mobility by taking emissions out of the driving experience. As an added benefit, because the vehicle has less mechanical complexity than a traditional gasoline-powered car, Nissan LEAF is designed to be friendly to the wallet as well as to the environment. Nissan LEAF's frontal styling is characterized by a sharp, upright V-shaped design featuring long, up-slanting light-emitting diode (LED) headlights that employ a blue internal reflective design that announces, "This car is special." But the headlights do more than make a statement. They are also designed to cleverly split and redirect airflow away from the door mirrors, thus reducing wind noise and drag. And, the headlights provide yet one more benefit in that they consume just 10 percent of the electricity of conventional lamps, which helps Nissan LEAF to achieve its world-class range autonomy. 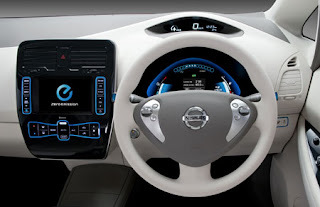 The dash-mounted monitor displays Nissan LEAF's remaining power – or "reachable area" – in addition to showing a selection of nearby charging stations. Another state-of-the-art feature is the ability to use mobile phones to turn on air-conditioning and set charging functions – even when Nissan LEAF is powered down. An on-board remote-controlled timer can also be pre-programmed to recharge batteries. For some Peoria-area car buyers, Nissan LEAF will be the perfect match, and the only car they will ever need. For others, Nissan LEAF will be a logical addition to the family fleet – the optimal choice for the daily commute, for example. Check UftringAutoBlog.com or UftringNissan.com frequently for updates on the arrival of this amazing vehicle. As with all new Nissan products, we are excited to see what's next!